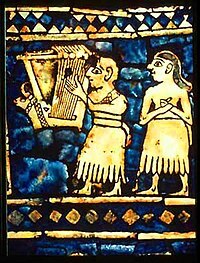 ↑ "The Sumerian Harp of Ur, c. 3500 B.C.". Oxford Journal of Music and Letters. X (2):: 108–123. 1929. ↑ "Lyres: The Royal Tombs of Ur". SumerianShakespeare.com. ↑ "History of the Harp | International Harp Museum". 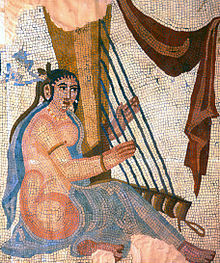 internationalharpmuseum.org. Retrieved 18 June 2016. ↑ Montagu, Jeremy (2002). "Harp". in Alison Latham. The Oxford Companion to Music. London: Oxford University Press. pp. 564. ISBN 0-19-866212-2. OCLC 59376677. ↑ The Anglo Saxon Harp, 'Spectrum, Vol. 71, No. 2 (April 1996), pp. 290–320. ↑ The Anglo-Saxon Harp Robert Boenig Speculum, Vol. 71, No. 2 (April 1996), pp. 290–320 doi:10.2307/2865415 This article consists of 31-page(s).